An Orbital Sciences-built Pegasus XL rocket launches NASA's Space Technology 5 satellite trio from its Stargazer L-1011 parent aircraft on March 22, 2006. Three microsatellites,each the size of a large cake, rocketed into space Wednesday on a NASA missionto prove new technologies and observe space weather. NASA's Space Technology5 satellite trio rode an Orbital Sciences-built Pegasus XL rocket intoorbit in a flawless launch staged from a jet flying 39,000 feet (11,887 meters)above the Earth. "It looks likewe're three for three," NASA launch director Chuck Dovale said after thesuccessful launch. "It followed a smoothest count as I can remember on thePegasus program, I think we were rewarded tonight for the trouble we had theother night." 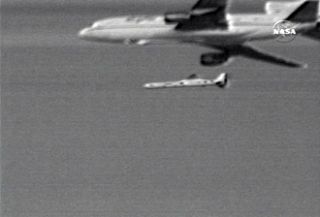 Today'ssuccessful space shot occurred one week to the day of an aborted March15 launch attempt, during which a last minute glitch prevented ST5'sPegasus rocket from detaching from its Stargazer L-1011 parent aircraft. AMarch 14 launch plan was also delayed due to a poorweather outlook. But none ofthose problems plagued ST5's launch today, which occurredat about 9:03 a.m. EST (1403) as its Pegasus booster fell free of its L-1011parent craft. By 9:20 a.m. EST (1420 GMT), all three ST5 spacecraft had flungaway from their launch carrier to start their planned 90-day mission. "We sawthree deployments of the ST5 spacecraft come off kind of like aFrisbee-fashion, which was kind of neat to see," Dovale said. During theirspaceflight, the ST5 spacecraft are expected to evaluate six technologies that includea new cold gas microthruster for flight orientation, an outer "skin" tomaintain the proper temperature, and software tools to aid autonomous groundoperations among others, NASA officials said. Each of theround ST5 spacecraft weighs about 55 pounds (25 kilograms) and measures about 21inches (53 centimeters) wide and 19 inches (48 centimeters) tall. Their $130million mission is part of NASA's NewMillennium program to develop and test technologies for future missions. The ST5probes are also equipped with a boom-mounted magnetometer, an instrument thatwill scan the Earth's magnetosphere to study the effects of high-energyparticles from the Sun's flares and coronal mass ejections. "Myexperiences have shown that missions like this are rollercoasters," said JimSlavin, ST5 project scientist at NASA's Goddard Space Flight in Greenbelt,Maryland, before today's launch. "I think the rollercoaster ride won't be overuntil the last day of our 90-day mission."